My hometown of Ishinomaki was damaged immensely by the tsunami in East Japan in 2011. My mother was living alone on the hill area of Hiyoriyama. She lost many of her close friends and relatives. Her distress in her loss made her dementia grow worse. Last February she entered a nursing home. Until now I was unable to support her and so were my teachers and friends. This causes me great pain. The Big Earthquake, the tsunami and the accidents with the nuclear plant in Fukushima continue to trouble me deeply even now. Chapters 40-55 of Isaiah are called the second Isaiah. They contain the prophecies about the release of the Israelites from slavery inBabylon. During their suffering Isaiah told them about the promise of their return to their homeland. He told them to depend on the God who made all things, who made us and will carry us when we turn grey, the God who will save us. He also repeatedly warned them never to depend on idols. The Japanese people were told that nuclear power plants were economical and safe. That was inaccurate. Everything made by humans is imperfect, however excellent. It may cause unexpected accidents and loss. Isaiah asked, ‘What is the meaning of suffering?’ He answered that we experience suffering so that we may be able to see the right path. Humans still have a lot to learn. Just in Japan we were exposed to radiation three times. Last Christmas our choir sang ‘The Desert Shall Rejoice’, based on Isaiah 35:1-5. As I sang this song, my thoughts went back to the disaster area. ‘The wilderness and the dry land shall be glad, the desert shall rejoice and blossom.’ My heart was moved deeply and filled with encouragement. Jesus said to his disciples, ‘In the world you face persecution. But take courage; I have conquered the world!’ (John 16:33). 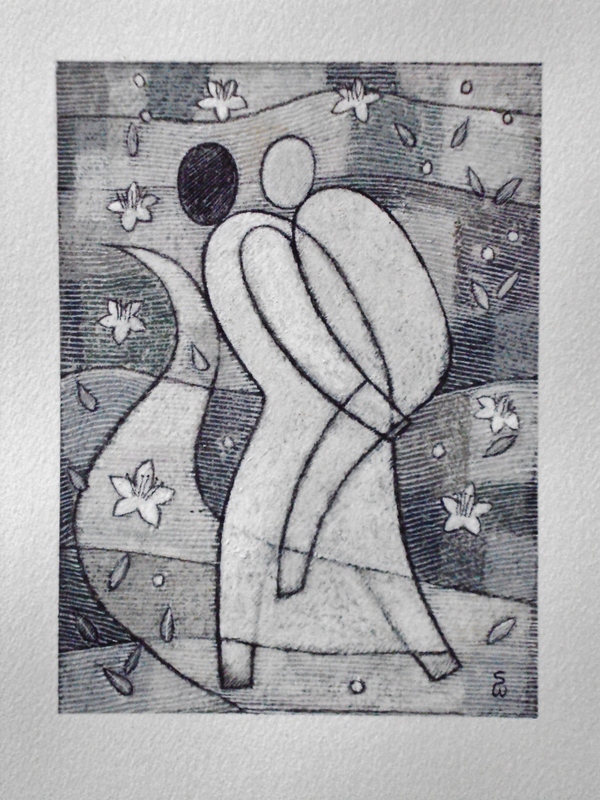 Soichi Watanabe: God Carrying Us, 2014, mixed media on paper, 19.5 cm x 14 cm. Soichi Watanabe was born in IshinomakiCity, north-east Japan, in 1949 and lives in KoshigayaCity, Saitama. Watanabe graduated in 1982 from the Ochanomizu Art School in Tokyo after having acquired, a decade earlier, an economics degree fromTohoku Gakuin University in Sendai. He teaches at a private art school that he started in 1982. Watanabe is the former chairman of the Christian Art Association in Japan (JCAA), a member of the Asian Christian Art Association (ACAA) and the Japan Artists Association (JAA). He was the 2008–09 artist in residence at the Overseas Ministries Study Center in New Haven, CT, USA. His oil paintings have been displayed in numerous solo exhibitions in Japan, the USA, Geneva and Germany. Translated and reposted from Fujin no Tomo (Friend of Woman, March 2014) on www.asianchristianart.org. From 26 until 28 June, 2014 Soichi Watanabe will have a solo exhibition at the Emmaus Gallery in Sendai, Japan, entitled ‘The Words of the Bible and Today’s Prayer’. He will also give a lecture entitled ‘My story of Christian Art’. Prof. Mitsuo Miyata will give the main lecture entitled ‘Resurrection’s Jesus: Chagall’s Green Cross’ on 28 June.